How can one concentrate on Naam for long periods of time? A common ‘problem’ that some Gursikhs talk about is having headaches when they do Simran or when they stop. This is completely normal! It is in fact your Dhiaan (Concentration) growing and shows that you are doing Abhiyaas (Repetition) correctly. However, on the other hand you can get headaches if you are trying too hard. Some people do Abhiyaas for an experience, some Japp Guroo Guroo very fast. Take it nice and easy, one step at a time. Take your time whilst doing Abhiyaas and you will surely feel the Naam Rass (Sweet Nectar of Naam). Now back to concentration. 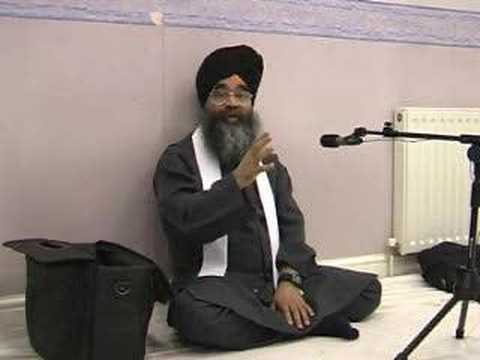 Whilst doing Swaas Swaas Simran (Simran with each breath) concentrate on the Dhun (sound) of VAHEGURU in your mind and contemplate the Dhun. The contemplation is one the most important things in developing concentration of the mind. Without contemplation, it is just meditation like what the Buddhists do. When we start contemplating we stop thinking about our surroundings and our mind comes to abide in Sehaj Avasthaa (spiritual stage of poise). Then we start doing Simran with ‘Ik Man Ik Chit’ (Single-mindedly) and it is peace all around. Keep doing Simran and concentration will come slowly. Practise makes Perfect. Read ‘Bandginama’ to find out more. « What is the True Home? I am doing simran from last 6 days, while doing simran i get distracted by several thoughts, out of no where so many daily routine or past thoughts would come in mind, please tell me the best way to concentarte on simran, as a beginner i do it for 15 mins, Is it a right duration for the inital stage of simran or i have to spend more and more time on simran? ?